2018 was a big year for real estate in Hermosa Beach. Although prices are still not at Manhattan Beach levels they’re getting closer all of the time. See all of the homes that sold in 2018 or see the current homes for sale in Hermosa Beach. It’s unusual that in a market in which the inventory remains so low and buyers will scratch and claw for just about any properties in the Sand Section, that the inventory of oceanfront homes remains very high. The obvious explanation is that most buyers are priced out of homes now starting in the $7.0M range, but this is a town of seemingly endless wealth. What really is driving this is the combination of the exclusivity of being able to buy an oceanfront home and the pace at which home prices along this rare stretch of beach have risen. Of the homes currently on the market (not including the condo hotel of the Beach House)and sold in the past 18 months the average sale price is almost $10.5M. March saw a healthy number of home sales in Hermosa Beach and an ever climbing median home price. The month of March 2015 saw 20 closed home sales in this small coastal community with a median home price of over $1,300,000. The lowest priced home was a 1 bedroom in the Victorian, a condo complex of of Prospect. The highest price home sale was an oceanfront piece of property at 2721 The Strand at $11,810,000. The home sits on an oversized lot in a fairly ideal location in the north sand section. Visit our South Bay home sales site to see other months and other cities. Visit our MLS link to see the current homes for sale in Hermosa Beach, CA. The best part of living at the beach is…..living at the beach. When it comes to really living at the beach, the “walk streets” of Hermosa offer it all. These pedestrian only “streets” are only found in the sand section and almost always mean that the homes are within a few blocks of the beach. What makes these streets so unique and so valuable? Most sand section homes on full lots face the street in the front, homes on both sides and an alley in the back. Fronting the street means the obvious challenges of car noise, parking challenges and a much higher level of traffic, especially in the summer. Walkstreets front a sidewalk instead of a street making for a much quieter, safer, and community friendly situation. older “fixers” or tear downs due to the premium location. Homes generally start in the $3,000,000 for a lot value sale and most larger homes start in the mid $5,000,000s. What makes the walkstreets different from the walkstreets in Manhattan Beach is the abundance of original beach bungalows. As Hermosa has always had a bit more of a beach vibe, many of these older homes remain with some being beautifully remodeled and others still in fairly original condition. These original cottages give these walkstreet a real beach feel and makes for an ideal environment to live the good life. Unfortunately searching and finding homes only on walkstreets isn’t easy as there is no specific category on the local MLS to designate them. If you would like to receive walkstreet listings please contact us or fill out our daily Hermosa Beach listing request and keep you notified anytime a new home comes on the market. 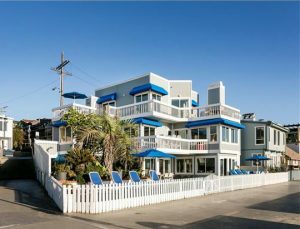 The Beach House in Hermosa Beach is a very unusual housing option as it’s one of the only “condo/hotel” complexes in the South Bay. Add to that the fact that it happens to sit beach front near the Hermosa Beach pier area and it makes it all that more appealing for investors. The owners can use the room (every room is individually owned and is not a timeshare situation) up to 90 days a year and the rest of the time it is rented and managed by the on site management. Income from the unit is split 50/50 but they handle any and all maintenance, upkeep, management, rentals, etc. At the moment there are two new listings, and one that has been on the market for a bit. Click to see the current condos for sale in the Beach House in Hermosa Beach. When most people envision perfection in beach living, they picture a home with endless views of the sand, surf and ocean. The magnificent homes of The Strand offer just that. With only a limited amount of space, these homes feature spectacular locations in which to sit back and relax. Many of the original bungalows have been replaced with stunning estates with nano doors, high end amenities, and those panoramic views. Homes range from the mid $6.0Ms to over $14,000,000. Properties rarely come on the market and often sell quickly due to the unique and somewhat priceless location. The majority of the properties are single family homes with a scattering of condos, townhomes and duplexes. The most affordable option is the condo hotel located at 1300 The Strand known as the Beach House. See the current beachfront homes on the Hermosa Beach Strand.